Your membership demonstrates your support for the only statewide organization dedicated to documenting the ornithology of Nebraska, and enables NOU to continue to develop unique informational and educational resources for birders and ornithologists alike. Every new member strengthens the voice of NOU in its important conservation efforts throughout the state of Nebraska. 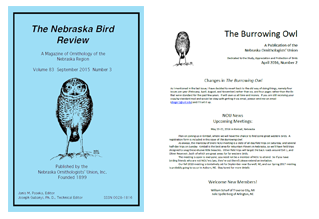 Our quarterly journal, The Nebraska Bird Review, documenting the ornithology of Nebraska and including rare bird photos and regional avian highlights of the previous season. Our quarterly newsletter, The Burrowing Owl, featuring NOU news updates, information about upcoming meetings, and more. Click on one of these NOU leaders to send an e-mail message.